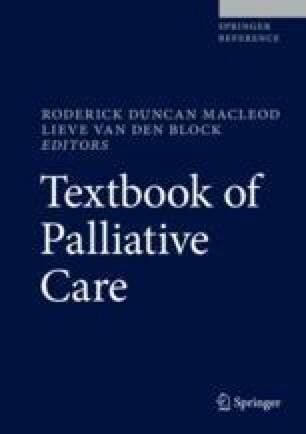 Many of the chapters in this Textbook provide state of the art, that is, evidence-based recommendations for the practice of palliative care and palliative medicine. This chapter on “Evidence-based practice in palliative care” will focus on the principles, advantages, and limitations of evidence-based medicine (EBM) and evidence-based practice (EBP) in general and specifically within the field of palliative care. We will discuss the concepts of EBM/EBP from a historical perspective, their role within the field of palliative care, the way EBM/EBP is practiced by a clinician in a stepwise approach, and critically reflect on how these concepts have developed over the past decade. The development of EBM/EPB has had an enormous impact on the way medicine is practiced today. It should not however be considered cookbook medicine. Its future lies in generating useable evidence that can be combined with context, professional expertise, and patient preferences to provide optimal treatment and care to individual patients. Brouwers M, Bhattacharyya O, Team TG-MR. Guideline implementability for decision Excellence Model GUIDE-M [Web page]. 2014. Available from http://www.agreetrust.org/agree- research-projects/guide-m/.